Valiant Comics’ first feature film adaptation has been filming in South Africa for some weeks now, but not much has been heard or seen from the set (except for a few Instagram hints here and there). That’s changing today, however, as a raft of details have begun to emerge from an unlikely source: Game4Paul, a livestreaming fundraiser for disaster relief benefiting Reach Out WorldWide, the charity founded by Diesel’s late Fast and Furious co-star Paul Walker. 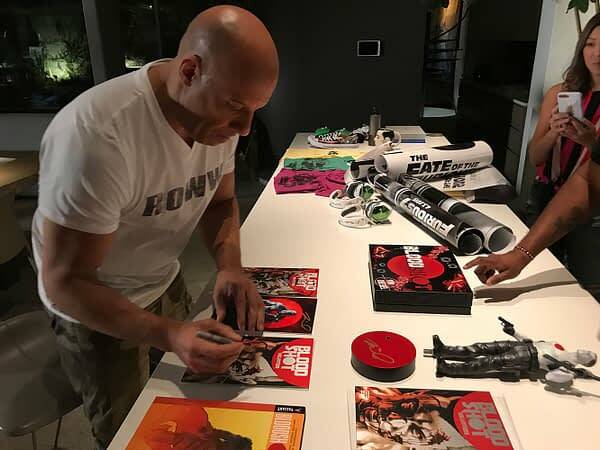 The rarest Bloodshot comic book EVER produced – signed by Vin Diesel, star of Sony’s upcoming BLOOODSHOT feature film! Specially manufactured for GAME4PAUL, this ONE-OF-A-KIND edition of the BLOODSHOT SALVATION #12 comic book comes complete with an exclusive cover featuring art by legendary comic artist Lewis LaRosa, imagining superstar Vin Diesel as Valiant’s relentless comic-book hero and signed by Diesel himself! 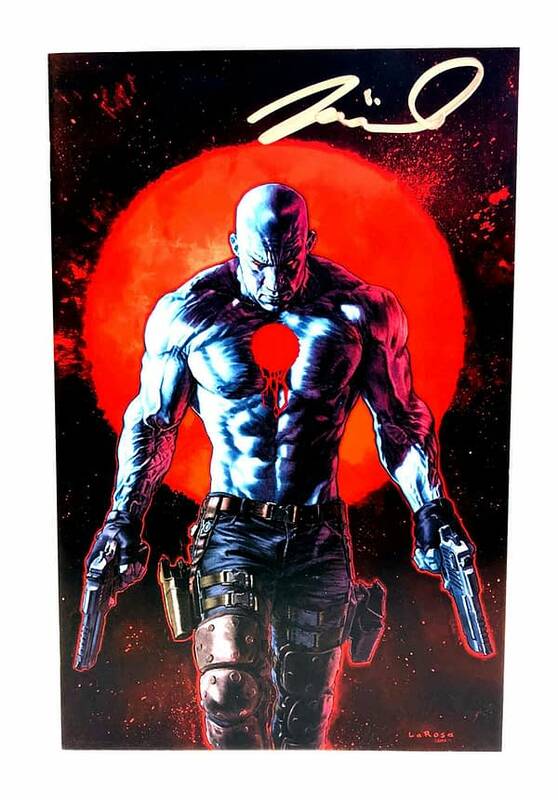 The art for this truly unique collectible was originally commissioned by former Valiant CEO & Chief Creative Officer Dinesh Shamdasani at the request of BLOODSHOT director Dave Wilson, who gave the art to star Vin Diesel as a gift and reveals Diesel’s likeness as the character for the first time, as rendered by his favorite Bloodshot artist, Lewis LaRosa. 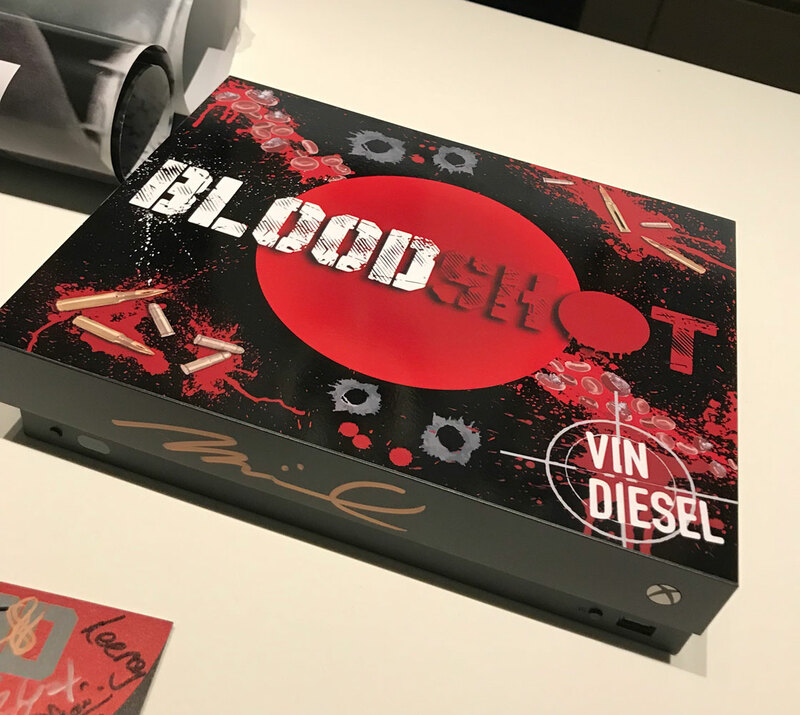 Get your hands on an exclusive Microsoft Xbox One X 1TB gaming console – fully customized to feature exclusive artwork by Johan Van Der Walt and detailing from Sony’s upcoming BLOOODSHOT feature film and signed by none other than BLOODSHOT star Vin Diesel himself! Comes complete with one Xbox wireless controller and is 4k gaming, 4k Blu-ray, 4k video streaming, and HDR enabled. Xbox Game Pass 1-month free trial and Xbox Live Gold 14-day included. 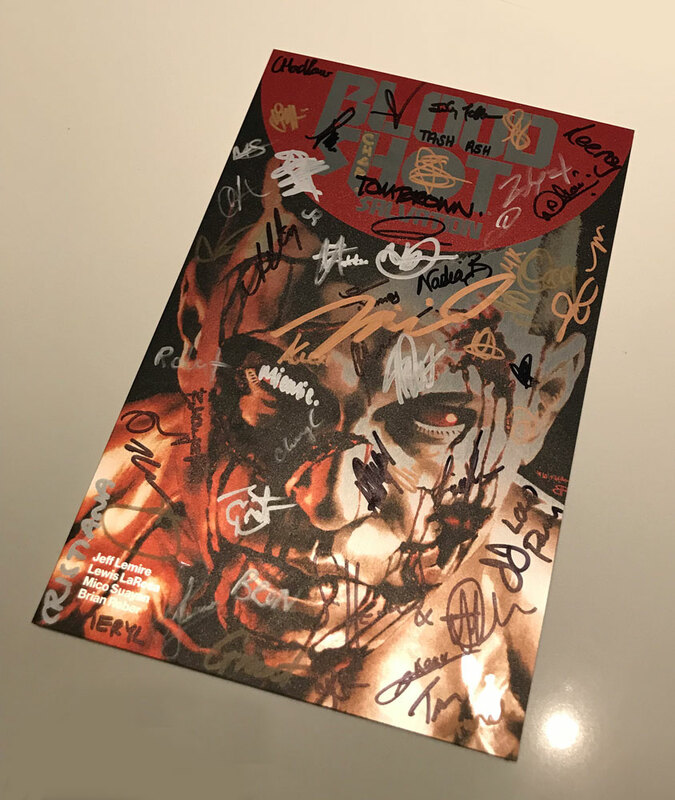 One of the rarest and most sought-after Valiant comic books ever released – signed by 55 members of the cast and crew of Sony’s upcoming BLOODSHOT feature film! This high-end, limited edition variant of New York Times best-selling writer Jeff Lemire’s introduction to Valiant’s Eisner Award-nominated Bloodshot mythos features artwork by artist Mico Suayan and comes printed via a special process on an actual brushed aluminum metal sheet, comes signed by stars Vin Diesel, Guy Pearce and Sam Heughan, director Dave Wilson, producers Dinesh Shamdasani and Toby Jaffe, as well as 50 additional cast and crew members behind the BLOODSHOT feature film! …follows Ray Garrison aka Bloodshot, a deceased soldier resurrected by weapons contractor Rising Spirit Technologies through the use of nanotechnology. Suffering from total memory loss but imbued with an array of staggering new abilities, Ray struggles to reconnect with who he was while learning what sort of weapon he has become…aided by a team of fellow augmented combatants codenamed Chainsaw. There are dozens of other Xbox, Fast and the Furious and Bloodshot related items (including more metal covers, statues, and the like) available now at Game4Paul.com, all for the benefit of Paul Walker’s Reach Out WorldWide charity and its ongoing missions around the world. 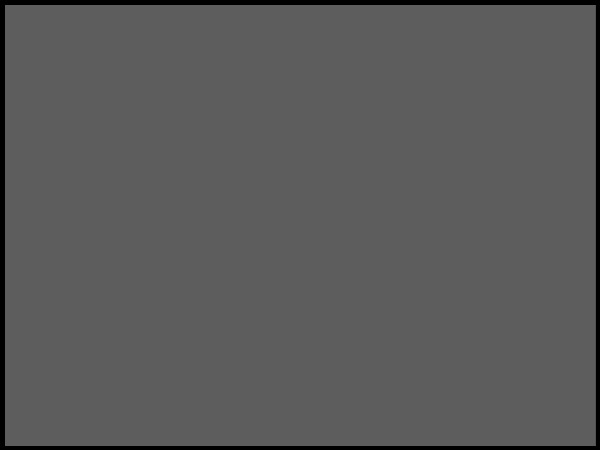 You can follow the livestream along at home beginning at 4 pm ET/1 pm PT today at Game4Paul.com or the Xbox Twitch channel… What are the odds that we might get some more Bloodshot news once it begins later today?